Looking back at my SIBO journey, I cringe thinking about some of the big mistakes I made. Luckily, I was determined to beat SIBO, so eventually I found my way! I wanted to share my biggest mistakes to prevent any of my fellow SIBO sufferers from repeating my same mistakes. In the initial phases of treatment, I mistakenly thought that clearing the SIBO required me to starve the bacteria! I hopped on the SIBO specific diet and did everything I could to avoid any foods with fibers that could feed the bacteria. Food was the enemy! Initially, I was very happy with how I felt, but after about four weeks my GI symptoms began to return. By about 6 weeks on the diet, I started to develop new and debilitating symptoms like fatigue, brain fog, insomnia, weight loss, depression and hair loss! I was a hot mess! Instead of listening to these signs that this diet wasn’t right for me, I rationalized the symptoms as die off or an additional food sensitivity that I needed to figure out! To make matters worse, I believed (as many others do) that the best course of action was to restrict even more. This continued restriction led to my health spiraling out of control. I developed hormone dysfunction, large intestine dysbiosis, nutrient deficiencies and severe mood disturbances. I was completely exhausted emotionally, physically and mentally on this diet! Diet changes should help you manage symptoms so that you can be more productive and enjoy your life. Restrictive diets can’t starve SIBO. By trying to starve that bacteria, you will fail to address the root cause and you will stress yourself out trying. These diets require a high amount of time and energy with little to no payoff. In my case, I got worse! 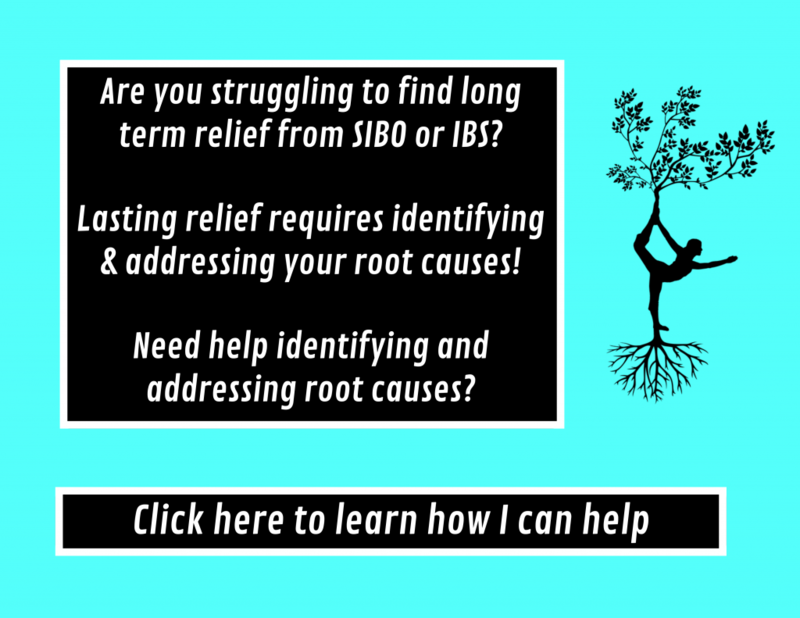 Your best bet is to treat the root causes of the digestive or motility disturbances that are causing your SIBO with a multi-faceted treatment approach. In my first three months of treating SIBO, I didn’t grasp the strong connection between delayed motility and SIBO! I felt that SIBO was a bacterial problem and that once I removed the bacteria from the GI tract I would be cured. I didn’t understand that SIBO is a secondary condition. According to Dr. Pimentel, 80% of SIBO patients have a deficiency in the migrating motor cortex activity! A deficiency MMC activity indicates that there is a break down in the brain gut axis! Without rebooting these cleansing waves, your intestines will be ripe for an overgrowth! These MMC deficiencies are driven by inflammation and dysfunction along the brain gut axis. This axis is mediated by the vagus nerve. Strengthening the vagus nerve’s connection between the brain and the gut can help repair the brain gut axis and MMC activity. After discovering the importance of this brain gut axis in correcting the cause of SIBO, I was determined to repair my broken brain gut axis! I noticed significant improvements when I did vagus nerve exercises consistently for 3 months. I also used a prokinetic after antibiotic treatment to help support my MMC activity through the healing process. When I was first diagnosed, (as I mentioned above) I believed that SIBO was simply a bacterial problem. I was singularly focused on killing all those beasties in my small intestines at all costs! I didn’t consider the potential risks of going overboard with antibiotic treatment. I just wanted them out of there! Antibiotics have their role in SIBO treatment, but it can be easy to over do it and you can become stuck in a kill mentality like I did! I kept relying on the antibiotics to get rid of my symptoms. In the process of trying to kill those bugs with multiple rounds of antibiotics (herbal and pharmaceutical) I ended up wrecking my large intestine bacteria. The overuse of antibiotics caused the overgrowth of many opportunistic pathogens in my gut that were not present prior to my SIBO treatment! My low fermentable fiber diet and my continued antibiotic use really killed off good bacteria and left my gut susceptible to pathogens. Antibiotics can help clear the overgrowth, but I’m not a huge fan of cyclical use. For me and many others in the SIBO world, antibiotics have a diminishing rate of returns. Antibiotics don’t treat the underlying cause of your SIBO either! I never tested after my first rounds of antimicrobials and this led me to assume that I still had SIBO because I was symptomatic. But, these assumptions are not always true! In my case, I decided to do another round of antibiotics since I felt that my first round of herbals was not successful. I was still having some SIBO symptoms and I assumed that I still had SIBO without testing. The additional round of antibiotics did not help any of the symptoms and actually made matters much worse for me. I developed a yeast overgrowth and opportunistic overgrowths in my large intestine. It is so important to test and not guess because bloating and other GI symptoms don’t always indicate SIBO. Maybe you cleared the SIBO, but you still have other imbalances or dysfunction that are causing your symptoms. Testing may seem like an added expense, but it can steer you towards the right treatment; which will save you time, money and energy in the long run. When I went on my restrictive diet, my thyroid hormones took a beating. There are three main reasons why my thyroid hormones plummeted. First, I was eating too low carb, which can down regulate thyroid hormone production. When we eat carbs, our body produces insulin to facilitate glucose uptake by our cells. Insulin is necessary to convert the inactive thyroid hormone (T4) into the active thyroid hormone (T3). Eating too low carb can prevent this conversion leading to low levels of active thyroid hormones. Second, I unintentionally reduced my iodine intake. My diet removed a lot of high iodine foods especially switching from iodized table salt to sea salt without increasing my intake of iodine with sea food like seaweed and fatty fish. Iodine is a mineral that is essential for the production of thyroid hormones in the body, T4 contains 4 iodine molecules while T3 contains 3 iodine molecules. Without adequate iodine, we can’t make the right amount of thyroid hormones. Third, the stress and high cortisol levels driven by low carb and restrictive eating can also inhibit the conversion of T4 to T3. If your thyroid hormones are low, delayed motility can result leaving your small intestines ripe for bacteria to thrive. It is very hard to beat SIBO with low thyroid hormones! I felt so much better from an energy and gut stand point when I increased my carbohydrate intake and supplemented with some extra iodine! The stress of grad school, starting a new job and moving to a new place pushed my GI symptoms over the proverbial edge! Not only was I dealing with these life stresses, I decided to jump into a very stress inducing restrictive diet for SIBO. I didn’t make stress management a priority during treatment and it really derailed my recovery. Cortisol reduces blood flow, nutrients, enzymatic release and motility in the gut. As a result, stress increases intestinal permeability and inflammation. Trying to fight off SIBO when you are stressed out can be an uphill battle. Daily meditations, hiking, sunshine, listening to music and laughing with friends are all critical to keep my stress levels in check and my gut happy! I failed to consider the potential consequences that my restrictive diet and antibiotic treatment would have on my large intestinal health. By failing to feed my large intestinal bacteria and bombing my gut with antibiotics, I created more problems down stream in my large intestines that would prevent me from healing from SIBO. Having healthy large intestine bacteria is necessary to stimulate MMC activity and motility through the GI tract. Studies on rodents show that manipulating the large intestinal bacteria can either decrease or increase MMC activity. Bifidobacterium is known to increase MMC activity! A low FODMAP diet has been shown to deplete Bifidobacterium. Therefore, SIBO diets can further reduce MMC function by starving these MMC promoting bacteria! The brain-gut axis is not a one way communication line. The gut bacteria also send messages to the brain through the vagus nerve about the gut environment. A healthy population of gut bacteria will keep the brain gut axis healthy, which is required to beat SIBO! It took me flying to another country to have FMT treatments for 2 weeks to fully repair my large intestines following my restrictive SIBO dieting and multiple rounds of antibiotic treatments. But, once my large intestines were replenished with diverse bacteria, my symptoms and gut health drastically improved! I don’t believe everyone needs FMT to repopulate their large intestine with good bacteria! But, it should definitely be a focus during treatment! To keep the large intestine healthy, you have to facilitate the growth of a diverse microbiome with a diverse diet filled with many prebiotic fibers. I am a fan or prebiotic and probiotic therapy at some point following antibiotic treatment to help establish a healthy large intestine (which is required for a healthy functioning small intestine). Working with a practitioner to determine when and how to increase probiotics and prebiotics into your treatment plan is a good idea! There is a prominent myth in the SIBO community that probiotics will exacerbate SIBO. On the surface, it does make sense. Why would you fuel the overgrowth with more bacteria, right? But, the research shows that probiotics don’t fuel the overgrowth at all. Quite the contrary, probiotics have actually been shown to help with SIBO eradication. Probiotics should help rebalance the large intestines, which is key to reducing inflammation and increasing MMC activity in the GI tract. Personally, I wish I would have started MegaSpore earlier than I did! It was a huge key in my weight gain and symptom improvement. I am a very independent person and I always pride myself on caring my own weight. I really hate asking for help, because I didn’t want to feel like a burden. I did not ask for help or support from my friends and family during my initially phases of treatment, which added to the stress and isolation I felt during treatment. No one seemed to understand what I was going through so it felt pointless to try and explain why I couldn’t eat certain foods or why I felt so bad. I struggled both emotionally and physically on a daily basis to take care of myself and to be productive at work. But, I what I failed to understand was that my family and friends wanted to help me. You are never a burden for those that truly love you. I did not have the support I needed, because I didn’t ask for it! I found functional medicine pretty early on in my SIBO journey, but my first practitioner was a very poor fit for me. The main issue I had with this practitioner is that he didn’t seem to know how to alter treatment when his SIBO plan was not working for me. Conventional medicine is criticized for being too cookie cutter since it prescribes the sames treatment to everyone with the same condition. Functional medicine is supposed to individualize treatment to address your root cause, but I see many practitioners using the same treatment plan for every SIBO patient. Cookie cutter plans will not work for all SIBO patients. I also was losing tons of weight on my SIBO diet, which my practitioner didn’t take as seriously as he should have. I was clearly malnourished and continuing to lose weight on the restrictive diet. When I ended up switching practitioners, my new practitioner’s first goal was to stop the weight loss by broadening my diet. Another problem I had was that he promised that his plan would work! Be wary of practitioners that guarantee their treatment plan will work. Even the most successful treatment plans may require some modulation or tweaks during treatment. I spent thousands of dollars with this ill fitting practitioner, which made it a little more difficult to jump ship. I had invested so much into this practitioner with nothing to show for it! But, like all bad investments, I had to get out if I was going to make any progress. Once I found a good fitting practitioner, I was able to adjust my treatment and make progress. I heard a practitioner (can’t remember who) on a podcast say, “you are the CEO of your own health.” You are responsible to decide on the best team to help you beat SIBO. If your doctor or practitioner is not right or pushing you around, find a new doctor! Don’t make the same mistakes that I did! Previous Previous post: I was interviewed and we talked all about SIBO!! Hello, I want to ask you about Bimuno prebiotics, how do you take it? I want to take Iberogast for motility also.Thanks. I would usually just take it in the morning with my breakfast and I would literally just mix it in a little water or just eat it straight from the package. Iberogast seems to be quite helpful for some! Best of luck! – could you share the pratcioner that helped you to heal? I need a better doctor. – how this vagus exercises work? I have so many questions. I am currently on a restricted diet for 40 days and in depression mode for not being able to eat or drink. I desperatly need help from someone that understand what I fell. Hi Marilia! Thanks so much for the kind words! The practitioner that I went to is local in Cincinnati area, which is probably not much help to you. I would try looking for functional medicine practitioners on the Institute of Functional Medicines web page. I hope that helps! Hang in there! I am considering Taymount, but once again on meat and oils just to remain functional. Thinking I should do a round of neomycin before I go, but not sure. Not in a position to get another functional med doc – the last was not helpful. Suffering 8 years with SIBO-C.
Did they give you any information about treating SIBO prior to FMT? Also wondering what foods you started with when you tried reintroducing new foods? I was able to do it last summer, but had a bunch of Hurricane Irma related trauma/life changes, and now when I try to start over with even tiny amounts I lose the next day to symptoms. Frustrating! Hi Lynn! I had cleared my SIBO prior to my FMT. I have heard that people do usually take a round of antibiotics prior to the FMT if they have SIBO, but I am not sure what Taymount’s stance is on this. I would consider consulting with Taymount and see what they say. I also wondered had you used megaspore or a probiotic prior to clearing your SIBO and if so, did you find it tolerable? Helpful? Sorry if you’ve answered this elsewhere, I tried to find a search feature on ur blog but couldn’t see one. Hi Janet! I found that bimuno helped with my symptoms. I would start low and slow to see how you respond. I didn’t experience any weight gain or anything from it either. I cannot tell you how helpful this article is to me. It is well-written, logical, and informative. Thank you so much! I am being treated for SIBO the last 3 weeks with a new GI DR. 8 months ago I tested positive with SIBO in a 3 hour breath test. In the note portion of the results was the word SIBO in bold letters. It was never addressed by my former DR. Even though I was and am suffering with all of the problems you have discussed. The test graph spiked up to a 20 in the last hour. MY new DR. went right to this document the first time he met me. IT is 4 in the morning and I just began reading your post. I don’t even know the rest of what you are going share. I had to stop to respond because you are already making it much easier to understand. The disconnection with fishing and hunting buddies because I don’t know who or what I am from one hour or day until the next. I cant wait to read the rest of your findings and share them with my wife. I’ve never been involved in posting. Don’t even know if I’m connecting with you. You mention prokinetics. How long do you think one should stay on these? I was using prucalopride for a few months but was wary to stay on it too long. Do you recommend a length or other prokinetics to use for long term? thanks! Thank you for the great information! I have a host of medical issues and I was told to start on a SIBO diet and just received paperwork on what and how to eat. I am completely overwhelmed and since I have neurological disorder I am afraid the prescribed diet is going to make that worse. Thanks again, your info is going to be super helpful! I’m debating a 2nd round of conventional + herbal antibiotics. The first round of Rifaxmin for two weeks (felt great on it), I retested positive for SIBO hydrogen two weeks later. Four weeks of herbal antibiotics following seemed to do nothing. How did you clear the SIBO before the FMT? Was it multiple rounds of the well-known antibiotics? Or was it one specific one that made a difference? How are you certain the SIBO was cleared before the FMT, and not that the FMT itself somehow manipulated the gut to clear the small intestine itself? Hi Jon! I did a round of Rifaximin and Neomycin in the spring of 2016 and then was retested negative in the fall of 2016 and then I did the FMT in December of 2016. I hope that gives you a better timeline. Typicially, if you have active SIBO before FMT, the clinic usually will advise you to do some sort of antimicrobial treatment before you have the treatment.